Living in Portland, Oregon, I am surrounded by countless expanses and pockets of overwhelming beauty. Opal Creek is a wilderness area located in the Willamette National Forest on the border of the Mount Hood National Forest. It has the largest uncut watershed in Oregon. Early prospectors waded in Opal Pool and remarked on the natural glory of the crystal water. 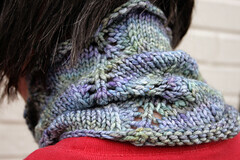 The stitch pattern in this cowl suggests gentle currents and leaves, inspired by Opal Creek. 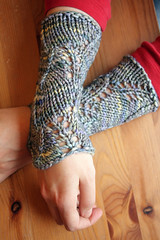 It's the February Installment of Twisted’s Single Skein Club 2010! This new pattern set also includes a crossword puzzle. Check out Twisted here. Thanks to Vivian for the lovely photos!